Star junior J.D. Antaya hopes to lead Blackstone Valley Tech back to Gillette, and he will have his hands full against a dominant Wahconah team. That game is a rematch of last year's D7 state semifinal, won by BVT. Now, the Beavers and the Warriors both have state title aspirations after dominant 2018 campaigns. 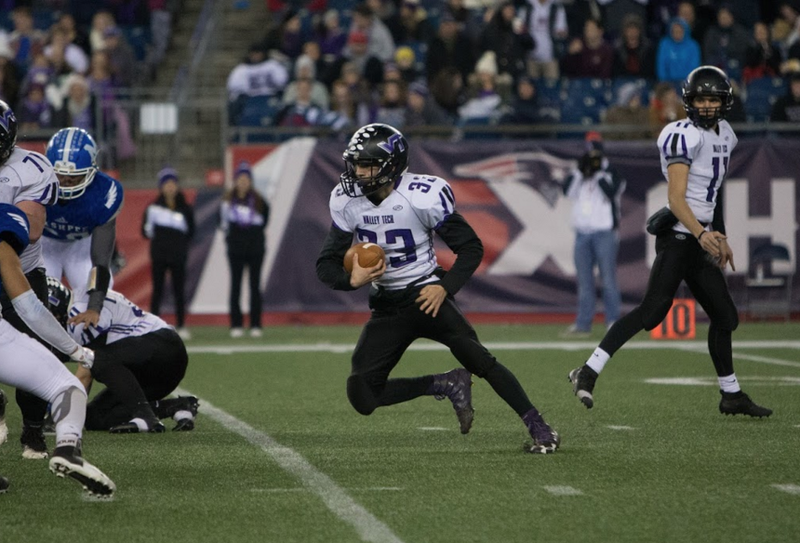 We have reached state semifinal weekend in the MIAA Football season with 10 teams hoping to join six others who have already cemented their placement at Gillette Stadium. Now for this weeks picks! Feld’s Pick: This should be one of the better quarterback matchups of the season with Jay Connolly and John Roberts set to face off against one another. Tewksbury has been resilient all season long, but the Dragons have too much speed and too many playmakers for the Redmen. Parello’s Pick: Not gonna over think it here: I've been rolling with the Dragons since their first battle with Hingham, and I see no reason for change this week. Feld’s Pick: First one to 50 wins! No, but seriously the amount of offense in this game is likely to be outrageous. St. John’s has been relentless with Eamonn Dennis back in the fold, but something tells me after last year that Springfield Central is ready to turn the tide and reach Gillette Stadium. Parello’s Pick: It just feels like Springfield Central has been building toward this year, and this game, doesn't it? St. John's is playing its best football at the right time, but I'll go with the team that handled the Pioneers earlier in the season, and hasn't been challenged since. Feld’s Pick: The rushing attacks are the headline going into this one, but I think this Sam Bolinsky’s time to shine. Nashoba has been in close battles all season long making them well prepared for a showdown with a tough Fisherman team. Feld’s Pick: With two high-profile passing attacks, this game has all the makings of an instant classic. 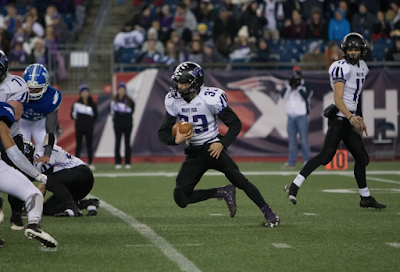 While Graham Inzana has had a terrific season, Aidan Sullivan gets the last laugh as the Sailors advance to Gillette Stadium. Parello’s Pick: Much like Duxbury, Scituate's offense looks pretty much unstoppable at this point, so I'll roll with the Sailors to get to Gillette. Feld’s Pick: Nipmuc has been nothing short of dominant this postseason, and I expect that to continue against a stingy Longmeadow team. Parello’s Pick: Nipmuc got knocked around by West Springfield in this game last year, but this team, especially on defense, has come a long way since then. This looks like it could turn into a rock fight, and I think the Warriors have the biggest rocks. Feld’s Pick:Stoneham came in as the favorite in Division and so far they have done little to quell the doubters. The Spartans explosive running game highlighted by Christos Argryoropoulos and Seth Russell finally gets them to Gillette. Parello’s Pick: Plot twist! I'm actually taking a CMass upset special, just not the one y'all expected. Stoneham is great, but this Littleton team is hot, and can present all kinds of problems. Yes, like all recent Littleton teams, the Tigers play great defense, and can run the ball of variety of ways, mostly led by stud RB Mitch Beaudoin. But, this year's squad also has a dangerous passing game, powered by the Lynn Brothers (Sophomore QB Braden and Senior WR Austin). It's as complete an offense as Stoneham has faced all year, and I think it pushes Littleton over the top for coach (and father) Mike Lynn. Feld’s Pick: The Spartans are battle tested, but Cohasset has played with no fear in this postseason. After knocking off Mashpee and Abington, both on the road, the Skippers feel like a team of destiny at this point. In a back-and-forth affair, Matt Lund has a breakout second half before Clifford Ward seals it with a pick. Parello’s Pick: Yeah, Cohasset assumed the mantle of favorite when it handled Mashpee, so it's hard to pick against the Skippers, even though St. Mary's knows how to win this late in the tournament. Parello’s Pick: I don't know man, BVT has been pretty dominant too, winning nine in a row in blowout fashion since losing to Millbury in week one. The Beavers shocked the state by getting to Gillette last year, and nearly knocking off a dynastic Mashpee squad, but I don't think it will be quite as surprising this time around. Heck, the Beavers beat Wahconah in this same game last year, and do-it-all junior J.D. Antaya is playing the best football of his life right now, on both sides of the ball. Feld’s Pick: It's been quite the run for West Bridgewater, but Pope John simply is too quick and has too much speed for anyone in Division 8 to keep up. Parello’s Pick: Can anyone in D8 challenge Pope John? This might be the week we find out, with resilient West Bridgewater giving it a go, but I just can't see them knocking off the Tigers. Feld's Pick: I've been on the Hoosac train throughout this postseason....until now. The Hurricanes should keep this one tight due to their physicality, but St. Bernard's has too many options on offense, and enough playmakers on difference to pull out a win. Parello's Pick: The Bernardians are in Gillette or bust mode right now, and look like an absolute wagon coming out of D8 Central. Are they Central MA's best chance for a state title? It's not crazy to think so, but getting past a talented and experienced Hoosac Valley team won't be easy... Still, gimme St. B's in a fun one.